On the weekend of September 8th, New Haven was brimming with energy. There were events happening throughout the city to foster progress for people and the environment. The first was a summit presented by the Yale Art Gallery and Artspace, a contemporary art non-profit. This summit, called “Homage: Soil and Site” was seven hours long and drew in some of the national leaders in the environmental movement today—household names like Eddie Bautista and Elizabeth Yeampierre. Oh, you haven’t heard of them? There’s a reason for that. 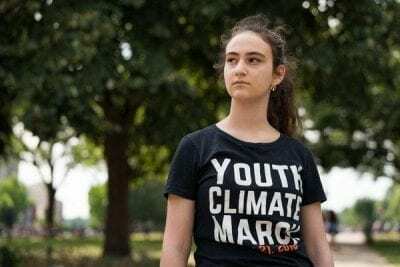 They are self-proclaimed environmental justice advocates, a group that has had little space or power in the environmental movement until recently. ​ Environmental justice, put simply, is the fair treatment and meaningful involvement of all people regardless of race, color, national origin, or income with respect to environmental conditions, regulation, and change. 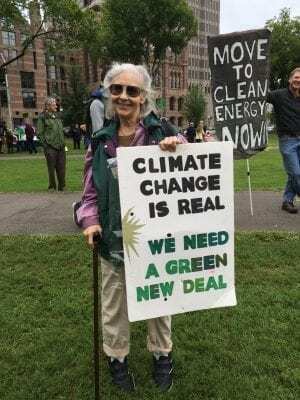 Those on the frontlines of climate change and other forms of environmental degradation are often the most economically and politically repressed. 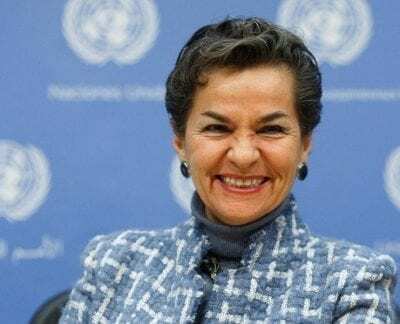 Impoverished island nations facing increased hurricane activity, poor urban communities facing the worst of air pollution, minority communities having little influence over the siting of a landfill in their backyard, and indigenous people facing potential contamination of their rivers by powerful oil companies should be given a seat at the table in discussions of policy and change. After all, they’re the ones who have experience dealing with the problems that we’re trying to solve. After decades of effort on the part of environmental justice advocates, we are finally reaching a point where all voices are being heard. This was evident at event number two of the September 8th weekend, a rally for “Climate, Jobs, and Justice.” This event was unique in the groups that came together in order to make it happen. 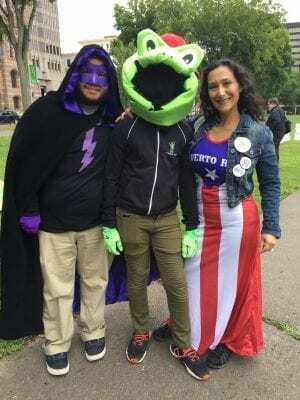 There were the typical organizations that are an important presence at environmental rallies in the state, notably the Sierra Club and 350CT, in addition to other groups such as the CT Puerto Rican Alliance. This meant that there was a larger variety of speakers and performances than the typical rally. There was a presentation of an electric car, and there was also a performance by local rappers about police brutality. There was a call to action for protecting CT’s Green Bank, and there was a young Latinx girl who sung about coming together as one. One stop of the rally was to admire a fuel cell, while another was for a local group to speak on issues related to prison reform. Rallies like this give hope for continued collaboration as we strive to create a safe and healthy environment for all people. The OEP is working on incorporating environmental justice as a focus as well. We recognize the importance of indigenous people to our country and to the environmental movement. Worldwide, they are protectors of 80% of the world’s biodiversity, despite only living on 20% of the world’s land. They hold Traditional Ecological Knowledge (TEK) that is vital to the stewardship of land, and utilized by many, including the US National Park Service. 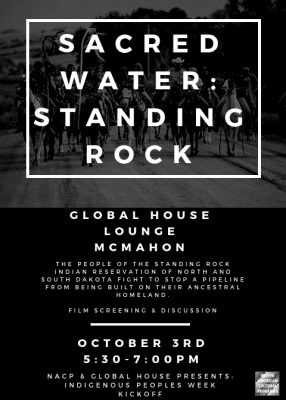 To honor this, we have partnered with Global House to hold a film screening and discussion of Sacred Water: Standing Rock Part 2 on October 3rd about the Standing Rock protests. 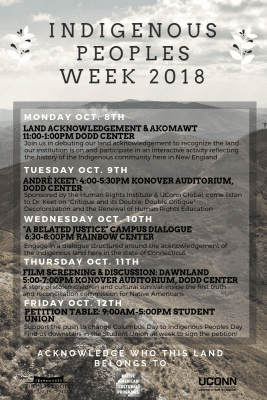 It’s the kickoff for Indigenous People’s Week, a series of events at UConn that aim to replace Columbus Day with a celebration of indigenous people in our country. Please join us in the Global House Lounge at 5:30pm to learn more about this incredible population of people!